The purpose of the California Rice Yield Contest is to provide an opportunity for rice producers and UC scientists to share information about intensive rice production in California and to recognize individuals who have achieved the highest yields in the state. 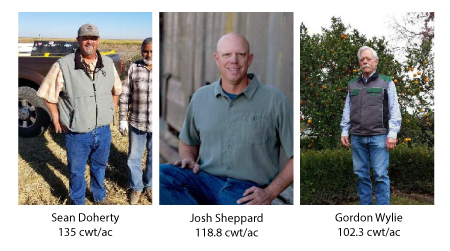 In 2015 University of California Cooperative Extension (UCCE) initiated the UCCE Rice Yield Contest as a pilot study in Butte county. The contest has now expanded to include all of Sacramento Valley. 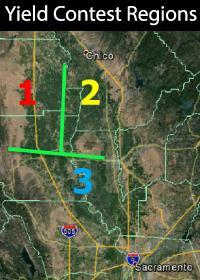 Due to regional yield potential differences, the valley was divided up into regions (1-NE, 2-NW, 3-S) using the Sacramento River and Hwy 20 as dividing lines (All fields south of Hwy 20 are a single region). Harvest and weighing are closely monitored by UCCE personnel. Yields are determined from a minimum of 3 acres from a 10-acre test plot and reported at 14% moisture. In 2018 we supervised the harvest of 21 fields: four from NE, six from NW, and 11 from S.
2018 winners were Sean Doherty, Josh Sheppard and Gordon Wiley. Sean farms near Dunnigan (S region) and had the highest overall yields at 135 cwt/ac. This yield is also the highest we have ever reported in this contest. Sean achieved these yields using the variety M-209 in a field that had previously been grown to rice. He used a seeding rate of 185 lb seed/ac. His total N rate was 185 lb N/ac. His herbicide program was League MVP followed by SuperWham/Grandstand. Josh Sheppard farms near Biggs (NW region) and had yields of 118.8 cwt/ac. This was achieved with M-105 planted at a seeding rate of 150/ac, a total N rate of 182 lb N/ac and a herbicide program of Butte followed by Regiment/Grandstand. Gordon Wiley farms near Maxwell (NW region) and had yields of 102.3 cwt/ac with the variety M-401 (a premium quality variety). In general, yields were lower in the NW region in 2018, perhaps due to fires and heavy smoke in late July/early August. Gordon achieved these yields using a seeding rate of 159 lb/ac, a total N rate of 122 lb N/ac, and a herbicide program that consisted of League MVP followed by Stam/Granstand. In the four years we have run this contest we are learning a number of things. First, high yields are possible from a number of commercial medium grain varieties. Winners have included M-105, M-205, M-206, M-209, and now M-401. Second, yield potential varies from year to year (with 2017 being low) and vary throughout the valley (the reason farmers compete with growers in their own region). Third, even at high yields, the head rice and milling yields remain good (head rice totals for 2018 contest winners ranged from 65-71; total milling yields 70-75). Fourth, to achieve these high yields, fertilizer N rates were typical for California and ranged from 122 to 187 lb N/ac. Good, uniform stand establishment stood out as being important in 2018. Look for 20 to 25 seedlings per ft2 and 70 tillers or more per ft2 at PI. Finally, it was interesting to see the range of herbicide programs used for the eight contestants that had yields in excess of 115 cwt/ac. Three of them used a program which included League MVP/Superwham/Grandstand; two used a program that included Butte/Regiment; two used a program that included Bolero/Grandstand; and one used Clomazone/Granite/Stam-Grandstand. High turnout for this year’s contest was in part due to a prize that we offered. The prize was a John Deere XUV-560E side-by-side. The high yield winner from each region drew for the prize and this year Josh Sheppard won. 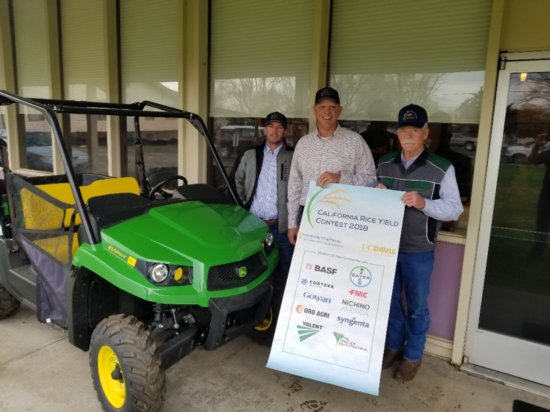 We were able to have this prize due to the generous support of our UCCE Yield Contest Sponsors. These were (in alphabetical order): BASF, Bayer, Corteva, FMC, Gowan, Nichino, Oro Agri, Syngenta, Valent, and Valley Truck and Tractor.